NEW ROOF IN THE PROCESS OF BEING REPLACED! PRICED BELOW APPRAISAL! LAKEFRONT! MOVE-IN READY, Zoned R-1 For Farm Animals. 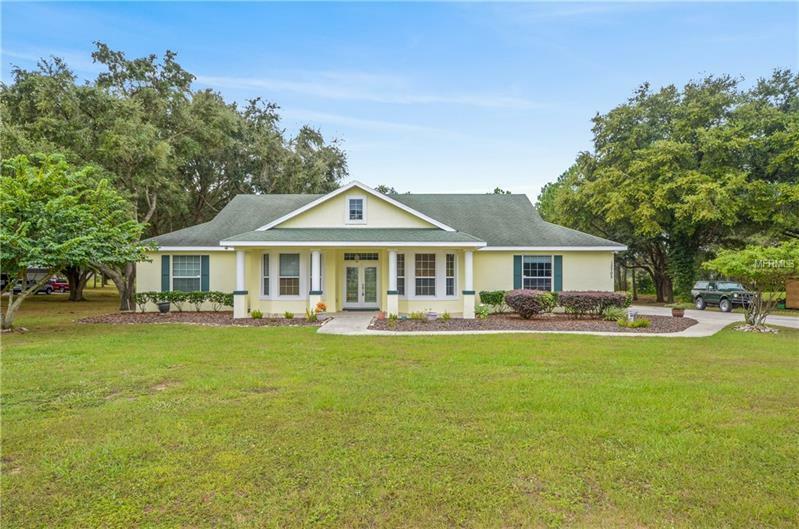 Florida Country Living At Its Finest, yet close to shopping on Rt. 50. Spacious, serene, natural, 2.2 acres with mature trees and tropical plantings. Skiing allowed on Lake Wash. 3 bedroom, 3 bathroom, plus office with custom built-in shelving, indoor laundry. Home features an etched glass double-door entry, interior French doors, granite counters with extended granite backsplash, wood cabinets, master suite with plantation shutters and coiffed ceiling with built-in lighting. Backyard fire pit and rock garden with waterfall stream. Relish your solitude or entertain in style with hideaway sliding doors opening up the expansive living space, and a sound system with built-in Bose speakers. Plenty of room to build a resort-style pool. Make this turn-key house your home and schedule a showing today!